THE 1975 are a band that blew up on the airwaves very quickly in 2013 when 'Chocolate' was released from their debut album and then seemed to have disappeared off the face of the earth in 2015. After posting teasers online, the band finally announced a winter 2015 tour which sold out incredibly quick but, thanks to my dad's O2 Priority, I was able to get tickets to see them perform at Bridlington Spa. After driving for an hour back to Hull then another 45 minutes to Bridlington it was safe to say that I was shattered after a long day at work so I wasn't particularly in the mood for the usual heavy gig that I normally write about. This one was going to be a bit more laid back which I was thankful for! I'm not going to lie, the audience was a mixed crowd but seemed to have been taken over by irritating teenagers with glitter covering their faces (I don't have a bloody clue either). We managed to be sensible and position ourselves towards the back with the rest of the oldies. First on stage was RATBOY, a band I'd not heard of prior to this gig. The band, who all looked a similar age to myself, came out and performed infront of a sold out crowd. Their vocals were great and fans of Jamie T would appreciate their music a lot. Each song sounded very similar but the vocals and band in general couldn't be faulted in terms of performance. 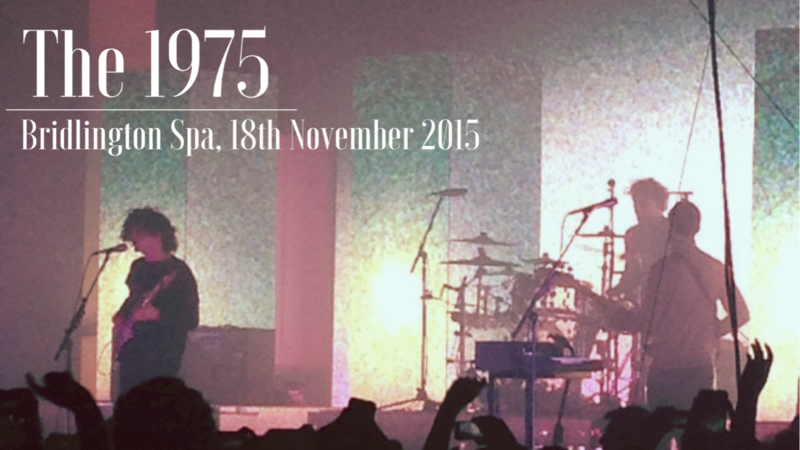 Next up were THE 1975. I previously saw these guys at Leeds Festival in 2013 in a jam packed tent. Since then they have released new material and have a new album coming out in the near future. I don't even know where to start with these guys! Opening with 'Love Me', the crowd were instantly singing away. The stage, set, lighting and sound were all flawless throughout the gig and with a mixture of old songs, big hits and new exclusives, the whole set was just fantastic. With a laid back atmosphere and I just enjoyed a good sing-a-long. Matty sang away flawlessly with a wine glass in one hand and the mic in the other, I'm used to seeing bands with bottles of beer or just shotting straight from a bottle of Jack Daniels! My overall rating of THE 1975 themselves is certainly 10/10. Just a little too light for me...now where's the metal at? !